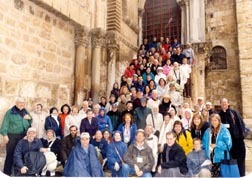 On Day Eight we took a group for an optional trip to Masada, Qumran, the Dead Sea and Jericho. Here is a video clip from that day. Pilgrims are now all safely home. The day after everyone left, we took our video crew to Nablus to get the scenes needed for our next DVD on the Apostolic Fathers. Justin Martyr was born in Nablus, which was then called Samaria and Flavia Neapolis. Our filming in Nablus went fine. It was closed for several weeks but we were able to get in with the help of Fr. Josef who is the Greek Catholic priest in Nablus. We filmed at the Well of Jacob where Jesus got a drink from the Samaritan Woman. We also found the ruins of the Roman city of Flavias Neapolis where Justin Martyr was born. We're now on our way to film in Lyons France to catch the segment on Irenaeus of Lyons for our Apostolic Fathers DVD. More soon.